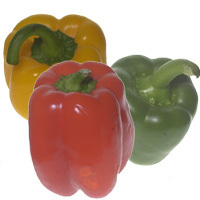 Occurrence: Bell pepper can be eaten raw or can be added as a seasoning to cooked foods. Allergy Information: Allergy to bell pepper is commonly reported with respiratory symptoms rather than reactions of the mouth or skin (most commonly rhinoconjunctivitis but also asthma) which is slightly unusual. Headaches were also reported which are sometimes associated with allergic rhinitis but are otherwise rarely reported as a symptom of food allergy. Allergy to bell pepper is often associated with the celery-birch-mugwort-spice syndrome. Willerroider et al. (2003)  reported the clinical symptoms of thirty four patients with a history of allergy to bell pepper as follows. Rhinoconjunctivitis (50%), OAS (38%), urticaria (32%), allergic asthma (24%), diarrhea (6%), angio-oedema (3%), cephalea (6%) and exacerbation of atopic eczema dermatitis (3%). Jensen-Jarolim et al. (1998)  reported the clinical symptoms of 11 patients as follows: Irritation of the oral mucosa (2/11), pruritus, urticaria, angioedema, atopic dermatitis (9/11), nausea, vomiting, diarrhea (6/11), shortness of breath (3/11). Ebner et al. (1998)  found immunologic cross-reactivity between allergens in spices from the botanic families Apiaceae, Piperaceae, and Solanaceae. Van Toorenenbergen et al. (2000) detected profilin specific IgE only in food-allergic patients but not in pollen- allergic patients. Cloning and molecular and immunological characterisation of two new food allergens, Cap a 2 and Lyc e 1, profilins from bell pepper (Capsicum annuum) and Tomato (Lycopersicon esculentum). Characterization of allergens in plant-derived spices: Apiaceae spices, pepper (Piperaceae), and paprika (bell peppers, Solanaceae). Leitner A, Jensen-Jarolim E, Grimm R, Wuthrich B, Ebner H, Scheiner O, Kraft D, Ebner C.
Immunoblot analysis of IgE-binding antigens in paprika and tomato pollen. Inschlag C, Hoffmann-Sommergruber K, O'Riordain G, Ahorn H, Ebner C, Scheiner O, Breiteneder H.
Cross-reactivity was observed with rBet v2 (birch pollen profilin) (Jensen-Jarolim et al. 1998) . Like other profilin allergens Cap a 2 is involved in pollen-fruit IgE cross-reactivity.